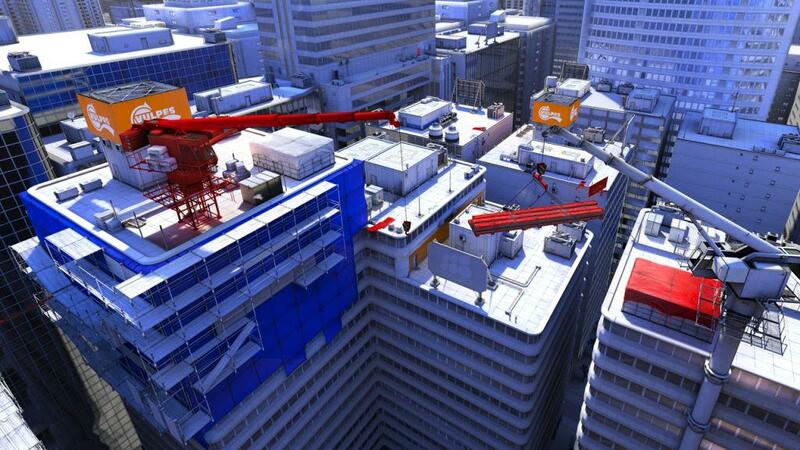 Mirror's Edge makes an incredible first impression. From the moment you start the prologue to the second you end it, you will swear that it's the most viscerally exciting ten minutes in all of video game history. You'll call up your friends and regale them with musings about running and jumping and dodging bullets. You will be in love. But a funny thing happens on the way to beating EA's newest 3D action game, some of that love turns into admirations, and the fun can occasionally turn into frustration. You'll still enjoy the game, but it won't take long before you start to see the game's faults for what they really are. 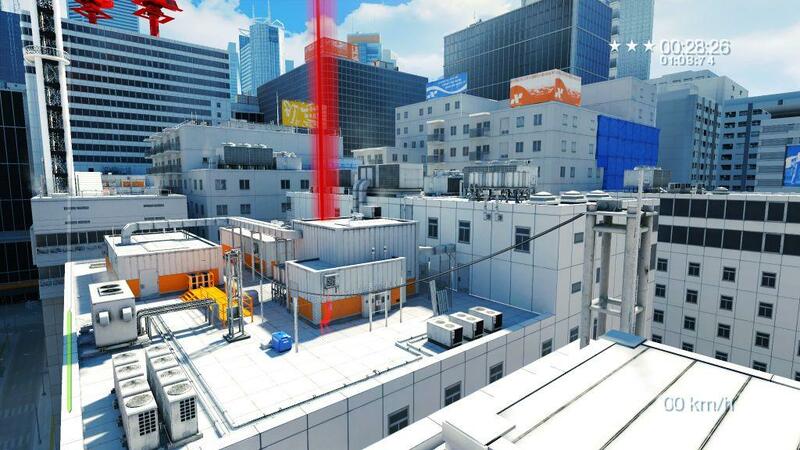 In case you have somehow missed all of the noise and excitement surrounding the game, Mirror's Edge is a first-person platformer. Instead of taking on the bad guys with guns and knives, your object is to run past them, jump over them and avoid them any way you can. You can do this because you play Faith, an anti-establishment runner. Her super power (if you want to call it that) is her ability to parkour, the extremely physical extreme sport that has you jumping off of walls, climbing up things with incredible speed and a cat-like ability to jump huge distances without getting hurt. 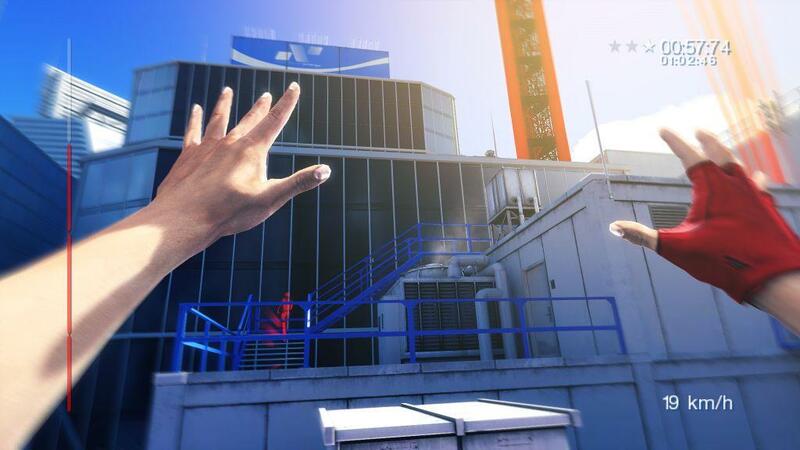 In real life parkour is one of the most exciting sports you can watch, so it shouldn't surprise you that Mirror's Edge is just as exciting to play. From a distance the game looks like every other first-person shooter on the Xbox 360. It's easy for an outsider to look at the game and think that it's nothing more than the platforming elements of Half-Life 2 or Halo 3. But that's not the case. Faith's play mechanics feel nothing like those of Halo or Half-Life, she has a flow and a grace that is all her own. What's more, the moves she can pull off give her a lot more control over her surroundings. In some ways the game should be compared more to Tony Hawk's Pro Skater than Halo. Although there aren't as many moves for Faith to pull off, it's just as important for you to master her jumps and abilities in order to beat the game. Once this all comes together you'll be on the edge of your seat with your eyes glued to the TV set. But let's not get too far ahead of ourselves. 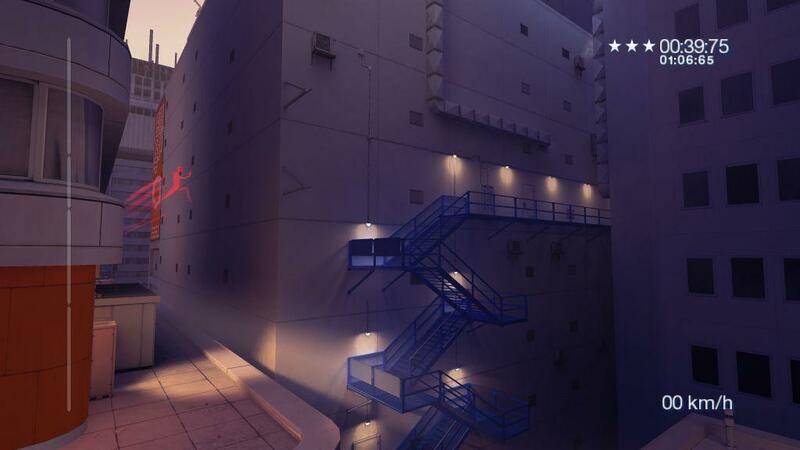 There is actually a story to Mirror's Edge, one told through a bunch of stylish cinemas. You play Faith, a government-hating runner who gets caught up in what looks like a giant conspiracy. Within the first two levels you are introduced to Faith's sister, a law abiding police officer who has been framed in the murder of a politician. Does Faith have what it takes to get to the bottom of this mystery? Of course she does, but it's going to take a lot of running up walls, jumping from rooftop to rooftop, swinging from objects and ascending (and descending) pipes. You do all of this in stark futuristic city that seems to be controlled by the police ("the blues") and a scary place for those who live outside the norms of society. These days it seems like we're getting one brown-colored first-person shooter after another, so to finally see color used in a brand new way is refreshing. The city you run in is mostly white, sometimes to the point of being blinded by its reflection. In contrast, red is the color that aides you on your quest. Need to find the right pole to climb? It's always going to be the red one. Need to find the right door for the building? Trust me; it's going to be the red one. Need to shimmy along the building? Well, you get the point. The game's look is giving a sudden splash of bright colors whenever you enter one of the game's many buildings. In all, color plays a very important part in this game, beyond that of just looking great. The action goes down over ten different chapters, each revealing more about the story and giving you some slightly different platform puzzles to solve. Unfortunately none of these levels are extremely long, so you're looking at a game that can be finished in anywhere from a few hours to eight hours. Although the action is constant and the story is interesting (for the most part), the game's length definitely works against it. The game is so much fun to play through that I can see a lot of gamers going from beginning to end in only one or two sittings, leaving some people with the impression that there wasn't enough of a campaign there. This is made worse when you consider that this is a single player-only game, one that doesn't have a whole lot of replay when you've made it to the end. This may be the kind of thing you want to show your friends once you've completed it, but you'll quickly discover that a second play through goes by even faster.Unfortunately the length is not the only major stumbling block for Faith. Because much of the game takes place on the roofs of some of the city's tallest buildings, one wrong step will send you spiraling down to the street for certain doom. The stakes are high, which is what makes the game's action sequences so amazing. But this one aspect is also what makes this game so frustrating. The gameplay is decidedly trial and error, which means that you're probably going to die a bunch of times before figuring out exactly what you're supposed to do. This is a problem that only gets worse when you get further into the game, it's entirely too easy to accidentally miss a jump or not run fast enough to get up the building. For some this won't be a problem, while those gamers who are not used to the first-person point of view will likely find all of this incredibly infuriating. The good news is that once you've mastered Faith's skills, it's hard not to have a great time running and jumping. Even when you die multiple times, you still want to see what you can do with these amazing powers. Of course, most of the time you don't have the luxury of experimenting because you're forced to deal with a group of people who are trying to kill you. 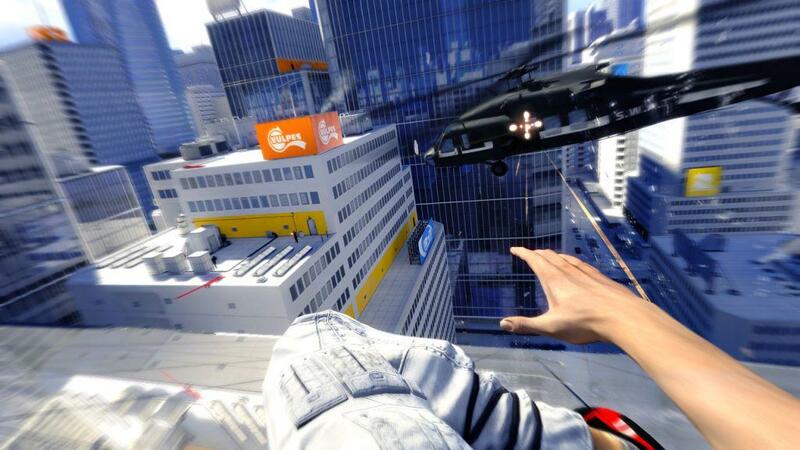 And it's not just heavily armored guards and police; it's also the helicopters that chase you from level to level. For the most part the object of the game is to avoid the police (and dodge the bullets), however you can use your fists to engage them in combat or, more importantly, counter their attack and get the gun away from them. While the game does give you the option of using weapons, the game's gun play mechanic isn't very strong. Not that it's supposed to be, she's a runner not a fighter. Needless to say, you shouldn't be going into this game expecting it to be a shooter. In fact, I would argue that the game works better when you realize that guns are useless and you can use your amazing agility to defeat just about every obstacle in your path. When you're done with the game's itsy bitsy story there isn't a whole heck of a lot left for you to do. The game does give you time trials to complete, allowing you to beat your own time as you run through familiar settings. This can be fun, especially if you're the type of person who really loves using all of the abilities in Faith's arsenal. However, this mode feels tacked on and probably won't hold your interest for long. Outside of that there's not much else for you to do or see, unless you absolutely must beat the game on every difficulty setting. While the campaign may be a short one, it's definitely a pretty one. 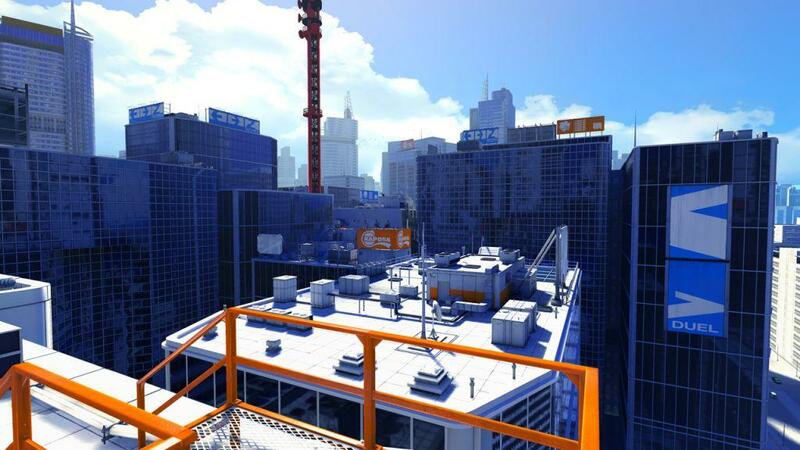 Mirror's Edge has some of the best graphics I have ever seen on the Xbox 360. Perhaps it's the amazingly clean look and the bright colors, but there's something about the game's visuals that pop out like nothing you have ever seen before. The visuals are only improved when you see them in motion, especially when you're sliding through gates, jumping off of buildings and battling the corrupt police. And I challenge anybody to deny how good it looks every time you kick open a door and see the insides of a building for the first time. 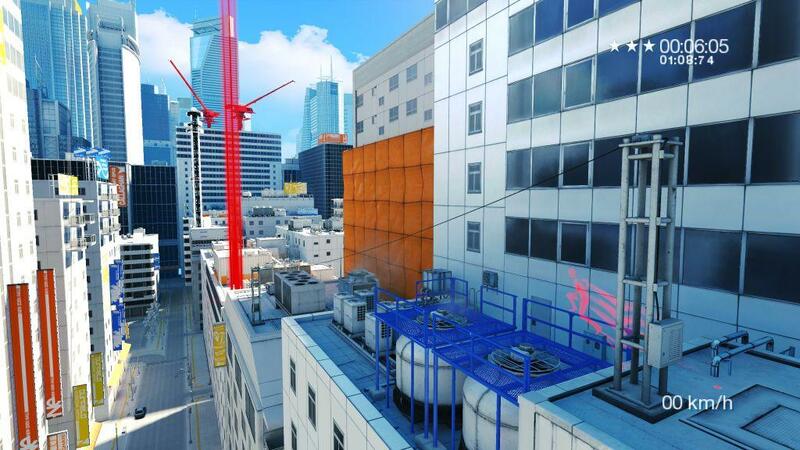 Mirror's Edge manages to get all of the big and small stuff right, which is why the graphics come together so well. The audio is also exciting, especially when you're being chased by the cops and a helicopter above. No matter what you're doing, the game pipes in some great electronica tunes. What is especially impressive is how seamless the music it, when it's calm the music will be nice and soothing. Yet when the game expects you to run, the music is pumped right up and full of exciting beats that get your blood moving. Throw in some solid voice acting and good sound effects and you have a game with memorable audio. Still, as much fun as the story mode is, it's a shame DICE Entertainment couldn't do more with the potential. 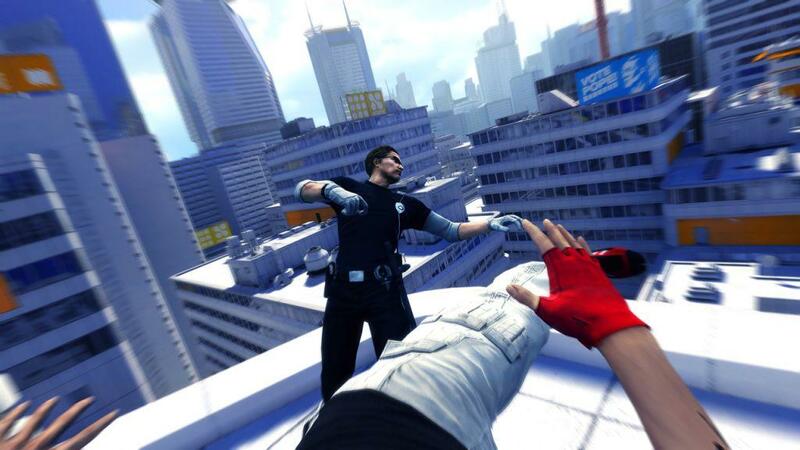 How cool would it have been to pit the first-person shooter players against these parkour runners in an online arena? Wouldn't it have been fun to have some real parkour races, and not just these tacked-on time trials? Maybe I'm just expecting too much, but it would have been nice to see more content added to the game's disappointingly short story. 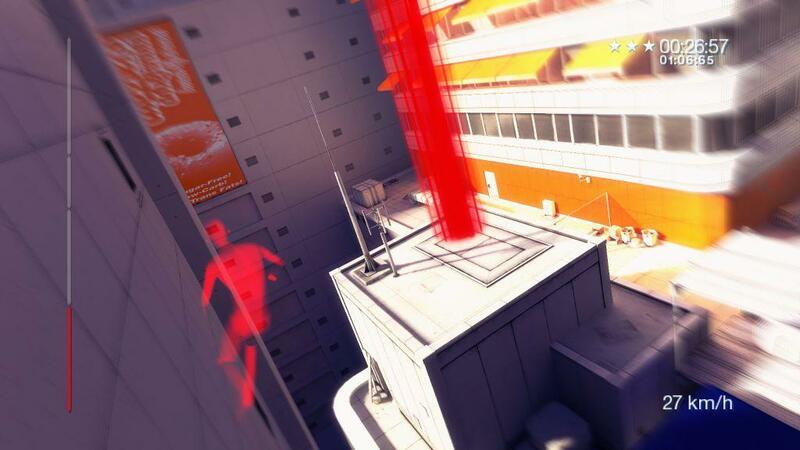 If you can get over the game's two or three shortcomings then you'll find that Mirror's Edge is an invigorating action game that will keep you on the edge of your seat from beginning to end. That's not to say it's for everybody, but it's easy to see how people can fall in love with Faith and her adventures. 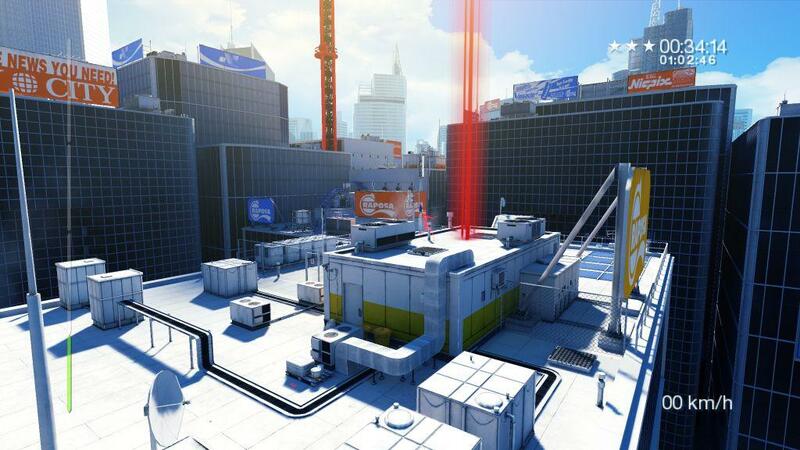 Mirror's Edge is a great start to a promising franchise for Electronic Arts, I can only hope that they intend on giving us more to do with each future installment. 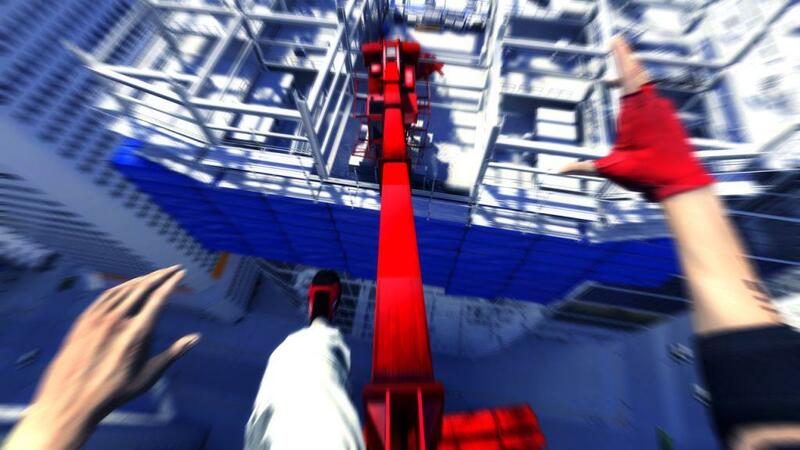 Mirror's Edge is a lot of things, but it's certainly not boring. The game features the type of visceral action you've never seen before in a video game. The flip side to that is that you're forced to play through a lot of trial and error levels and find that the game is far too short. It's not for everybody, but it's easy to see how some will have a great time getting to know Faith and see what she's capable of.